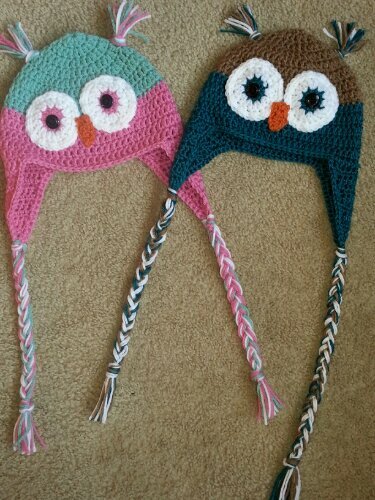 Last night I finished up the last two items for Alpine Originals children’s theme for the local Art Walk,,, Owl Hat’s…. The Art Walk is today from 4pm to 7pm in downtown Mt. Shasta …. Many galleries and shops will be open late to show off the different types of art we have in our town… It’s fun and so many great items in the shops! This is a great Children’s Owl Hat Pattern you can get for free from one of my favorite crochet sites… Repeat Crafter Me . She always has great projects and tips… Check it out! I will be hanging out for a bit at Alpine Originals this evening to support this event and promote National Crochet Month! If you happen to be around, stop by and check out our local artist’s handmade items! So here is to Art Walks, Owl Hats and National Crochet Month!